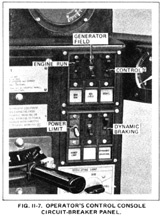 In 1977, General Electric made a change in locomotive nomenclature, by abandoning the traditional U-designation for an identification system that would be more meaningful. This change was applied throughout the standard domectic line. 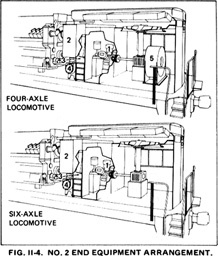 As with the previous Universal Models, a letter was used to indicate the number of axles ( B- 4-axles, C- 6-axles). 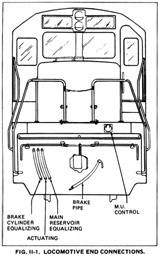 The number following the truck indentification represents the horsepower input for traction. The last number, 7, indicated the first model year for these locomotives.. In this case 1977. 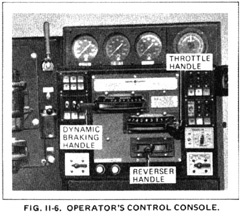 The Series-7 retained the standard locomotive underframes and diesel engines. The 7FDL8 engine for the 1800 HP class; the 7FDL12 engine for the 2250-2750 HP class; and the 7FDL16 for the 3000, 3300, and 3600 HP class. The 7FDL8 is an 8-cylinder engine, the 7FDL12 is a twelve cylinder engine, and the 7FDL16 is a 16-cylinder engine. The Missouri Pacific was the owner of three (3) different Series-7 models. The B23-7 built from 1978 to 1981, the B30-7A built in 1981 and 1982, and finally the C36-7 built in 1984. 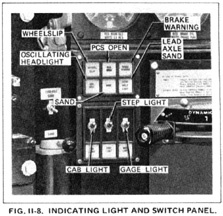 This information will focus on the Series-7 locomotives as a whole, but will refer more directly to the three (3) model types obtained by the Missouri Pacific. Fuel Capacity: 3,250 gals. Gear Ratio: 74:18 Minimum Continuous Speed: 11.5 mph Cooling Water Capacity: 350 gals. Tractive Effort: 57,2000 Sand Capacity: 60 cubic feet Lube Oil Capacity: 300 gals. Fuel Capacity: 3,250 gals. Gear Ratio: 81:22 Minimum Continuous Speed: 10.8 mph Cooling Water Capacity: 350 gals. Tractive Effort: 66,325 Sand Capacity: 60 cubic feet Lube Oil Capacity: 300 gals. Fuel Capacity: 4,500 gals. Gear Ratio: 83:20 Minimum Continuous Speed: 10.0 mph Cooling Water Capacity: 365 gals. Tractive Effort: 97,750 Sand Capacity: 60 cubic feet Lube Oil Capacity: 380 gals. 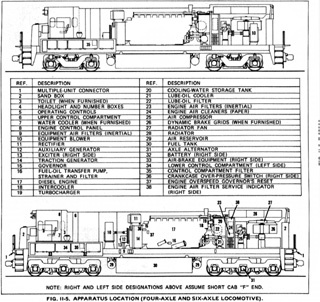 Below are scamatic drawings of the front and rear of the Series 7 Locomotives.